This volume explores how disability is seen, written about, read and understood through literature and translation. Foregrounding the asymmetrical world of power relations, it delves into the act of translation to exhibit how disability is constructed and deployed in language and culture. 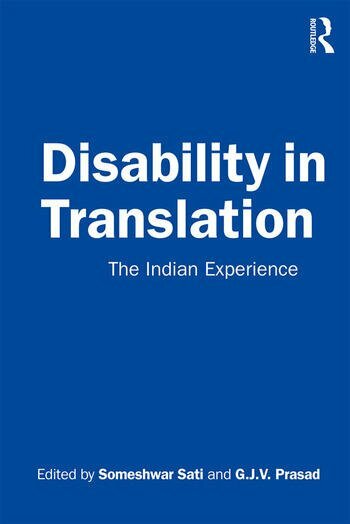 The essays in the volume reflect and theorise on experiences of translating various Indian language stories into English which have disability as their subject. They focus on recovering and empowering marginal voices, as well as on the mechanics of translating idioms of disability. Further, the book goes on to engage the reader to demonstrate how disability, and the space it occupies in our lives, can be reinforced or deconstructed in translation. A major intervention in translation and disability studies, this volume will be of great interest to scholars and researchers of literature, culture, and sociology. Someshwar Sati is Associate Professor at the Department of English, Kirori Mal College, University of Delhi, India. His research interests encompass Postcolonial Studies and the Indian English Novel, Disability Studies and Translation Studies. Dr Sati has edited three critical volumes on postcolonial theory and literature, Warble of Postcolonial Voices, Volume I and II and Writing the Postcolonial: Poetics, Politics and Praxis. G. J. V. Prasad is Professor of English at Jawaharlal Nehru University, India and former Director of the Jawaharlal Nehru Institute of Advanced Study, JNU, India. His major research interests are Indian English Literature, Contemporary Theatre, Dalit Writings, Australian Literature, and Translation Theory. He has co-edited with Sara Rai a collection of stories from Indian languages, Imaging the Other. His academic publications include: Continuities in Indian English Poetry: Nation language form, and Writing India, Writing English, along with five other edited volumes of critical essays, Vikram Seth: An Anthology of Recent Criticism, and The Lost Temper: Essays on Look Back in Anger, and Translation and Culture: Indian Perspectives, (along with Madhu Benoit and Susan Blattes) "Violets in a Crucible": Translating the Orient, and (along with Makarand Paranjape) Indian English and Vernacular India. Professor Prasad is also a poet and a novelist, and has most notably received the Katha award for translation from Tamil.